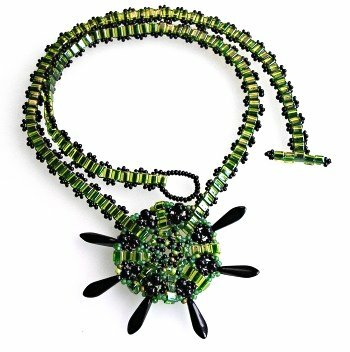 This necklace is a development of my original Peyote Bobbles Necklace and is one step on from my Beaded Beads and Large Pendant. Once I realised I could scale up the size I wanted to see if I could go back to my original idea and bead them as flat pieces. I began by beading the centrepiece and then added on the straps afterwards using co-ordinating beads. Once I'd made this I took this idea of working flat and played around with it, the results can be seen here.